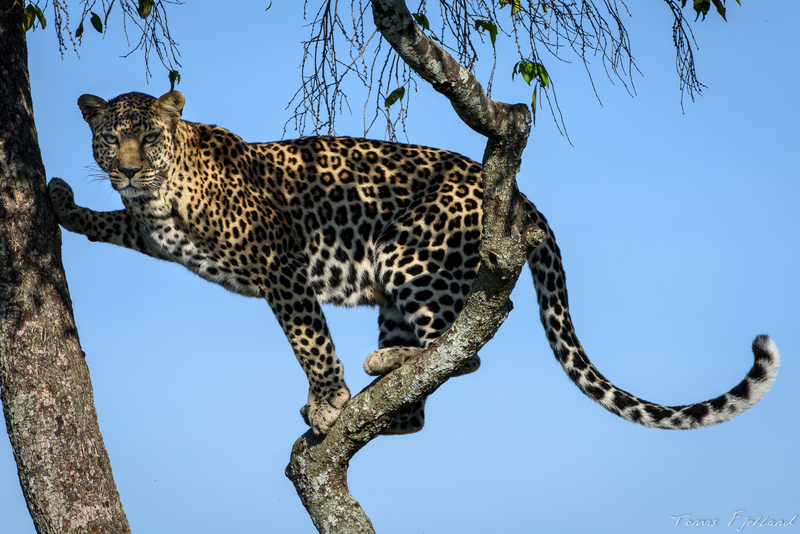 Day 7 is our last full day in the Masai Mara area and we plan for a good morning drive as well as a full evening drive. 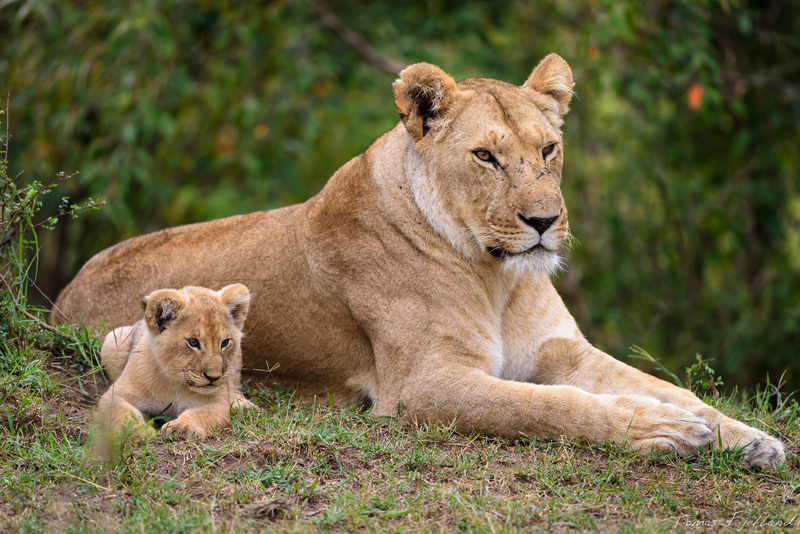 We set out northbound from the camp since one of the lion prides have been spotted not too far from the camp. Weather has continued to be shifting and clouds and rain seems to reduce our chance of that nice sunrise light. 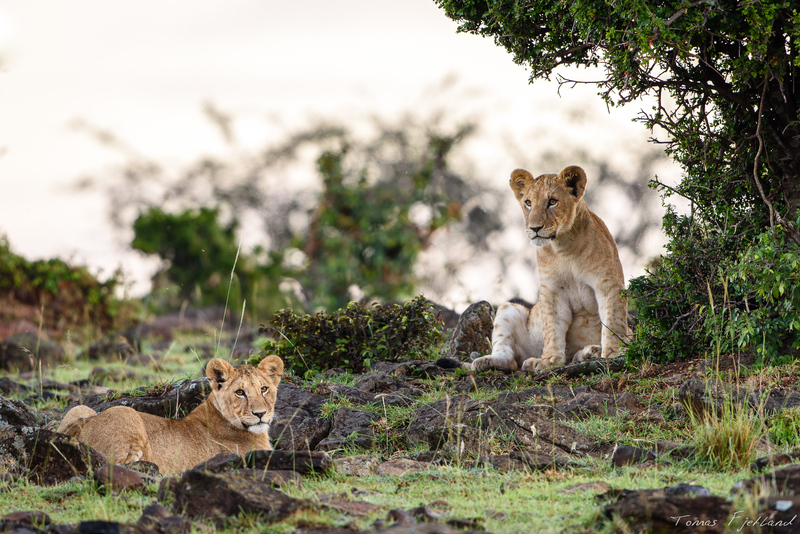 We arrive at a rocky hillside where some young lions and cubs seem to be gathered waiting for the adults. Presumably the older members of the pride were still out hunting. The youngsters are pretty calm, and since the skies are cloudy and grey, we hang around photographing them for a while. 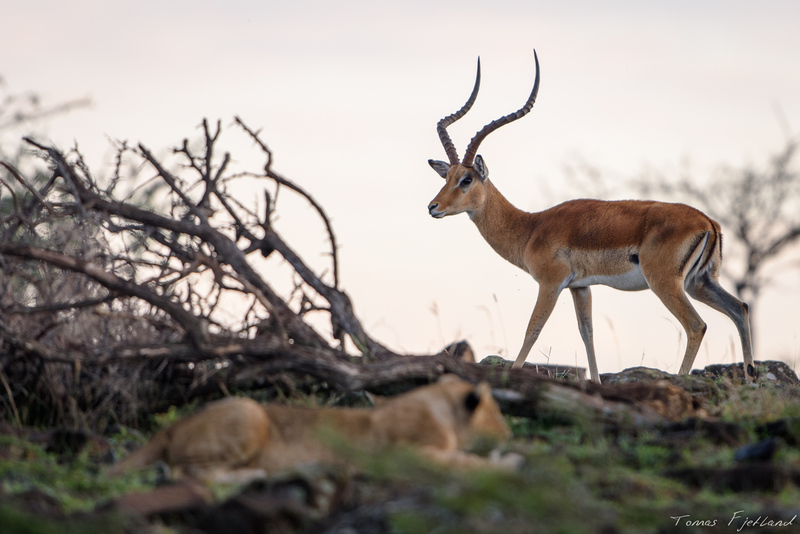 While we’re there, an Impala buck walks right into the area. One of the cubs decide to try to sneak in on it, but its clumsy attempt quickly gets discovered and the buck easily jumps away. They clearly have some leftovers from a previous meal, and one of the female cubs gingerly walks around with an antilope leg. The male cub is obviously envious and tries to beg for it, with no response. A male lion cub looks on with envy as sister walks by with leftovers from a previous meal. As we move down towards the Ntiakitiak river, the weather quickly clears up and what remains of that nice morning light warms up the riverbank. 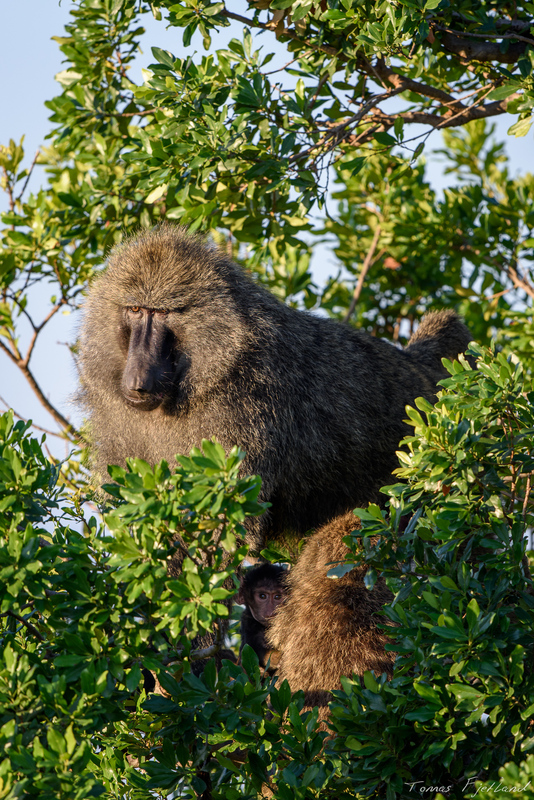 A group of baboons have settled in the trees above the hippo pools and sound the alarm as we approach. The guards keep a keen eye on us and the hippos below while the rest of the group are busy collecting fresh leafbuds in the trees. Baboons are one of those few animals that will truly eat anything if they have to. The little baby baboon is well protected by its mother and the dominent male as the group have settled in trees above the hippo pools. The hippos have returned to the pools after the nights grazing and don’t seem to pay much attention to us or the noisy baboons. They’re often quite restless in the mornings until the hierarchy in the pool has been established, but there were so few here there probably wasn’t a reason to fight for the space. 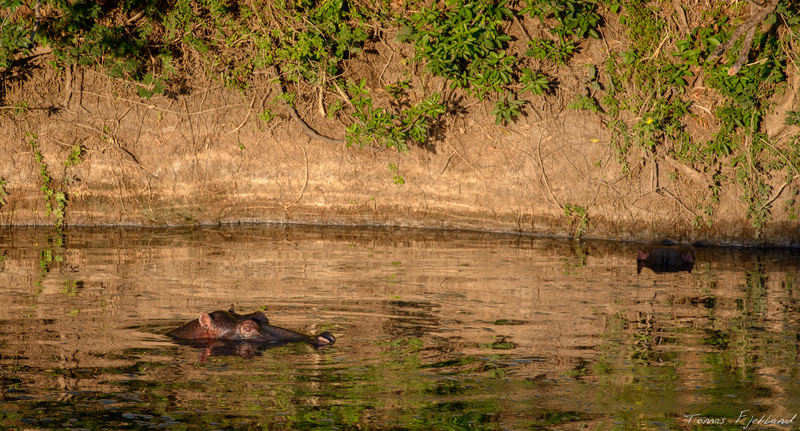 Hippos have returned to the hippo pools along the Ntiakitiak river for the day. The conservancy model differs from the national parks in that the land is originally private land owned by the local Maasai communities, and as such contains both settlements and livestock. 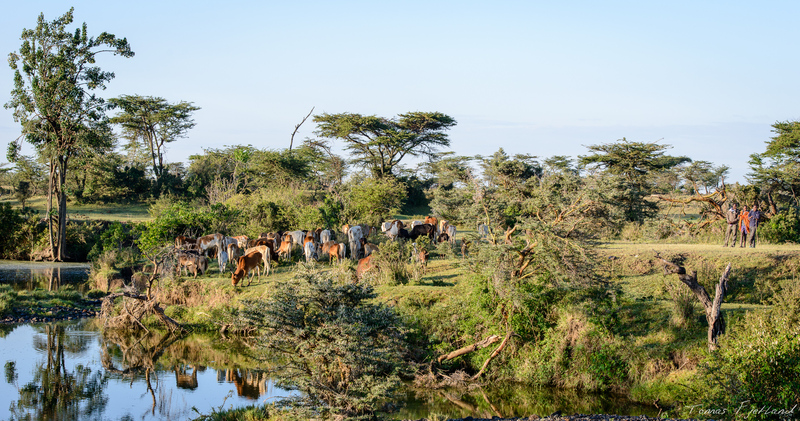 In addition to renting out space to the smaller, environmentally friendly camps, the presence of livestock provides additional benefits to the wildlife viewing in the conservancies. 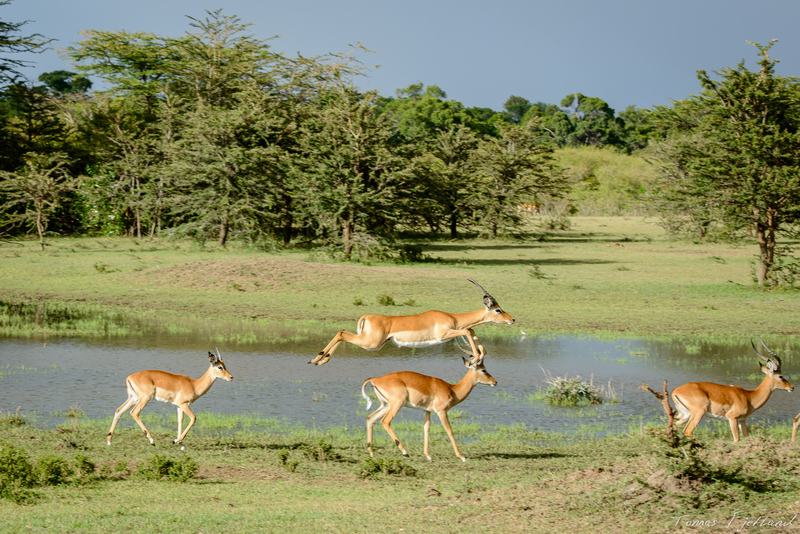 The cows and goats help keep the grass down, even when the big migratory herds are in Serengeti, providing better hunting conditions for the vulnerable cheetah. Along the Ntiakitiak river we meet this group of herders with their cattle, stopping for a drink. 3 maasai herders have led their cattle to the river. The conservancies balance the needs of wildlife, livestock and people, providing unique advantages for all sides. While many maasai always wear their traditional checkered clothes, some prefer more western clothes, especially in the cold mornings. 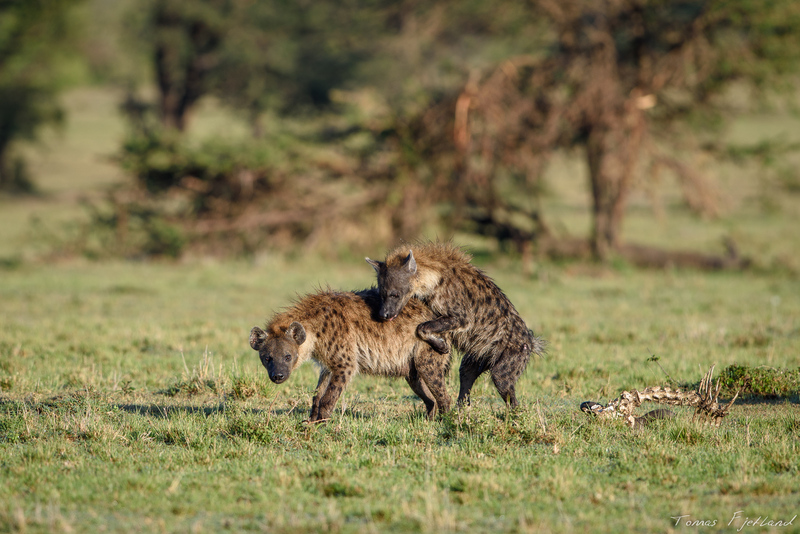 A pair of spotted hyenas mating. There’s a lot of growling and howling. The showers in the night and morning have made the ground pretty soggy, and the areas near car tracks quite muddy. A lioness with her two cubs are resting right by the tracks and the cubs have obviously been more focused on play than on grooming for a while. While we were watching, one of the cubs discovered a nearby warthog burrow and starts exploring the edges of the entrance. 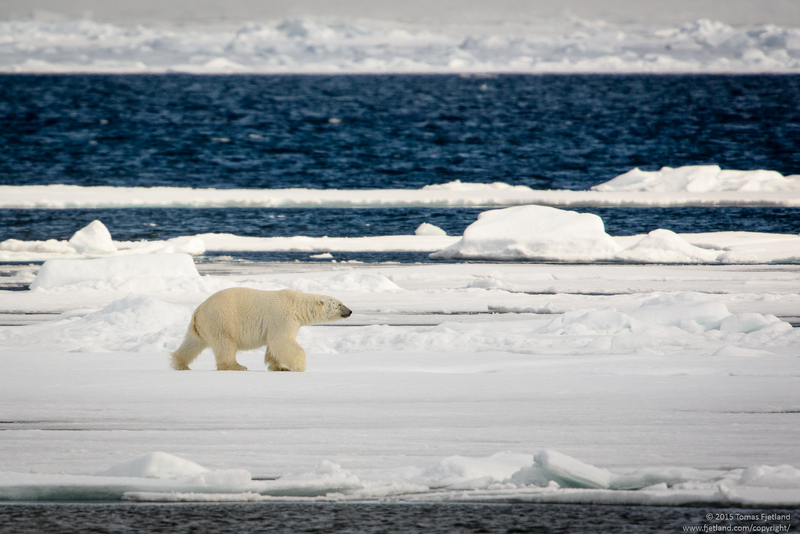 The mother, who have so far been looking relaxed and somewhat disinterested in the cubs activities suddenly get up and hurry over to the lair, with the more cautious cub in tow. She obviously felt it was best to make sure the burrow was really empty before the little explorer decided to enter it. 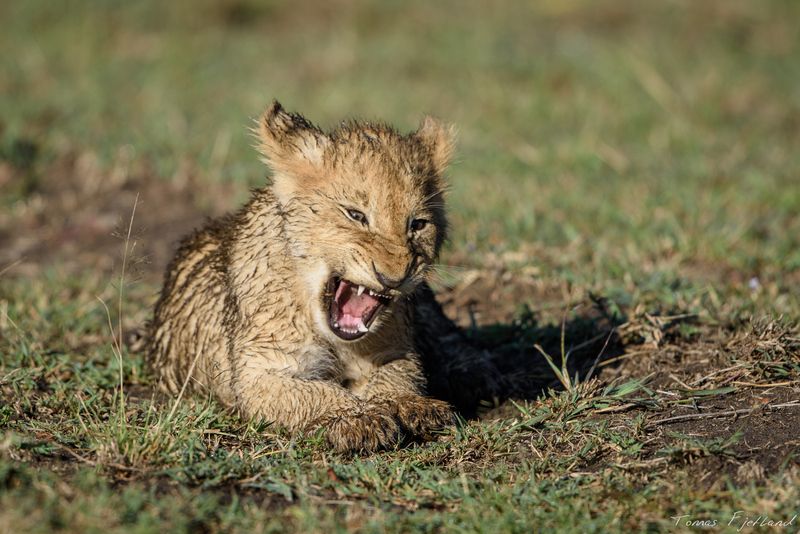 A protective warthog could easily kill a young lion that tries to enter its lair. Mother comes over to make sure the warthog lair one of the cubs found is safe to play in. Once she’s satisfied the hole in the ground is safe, she relaxes and lets the cubs go back to playing on their own. 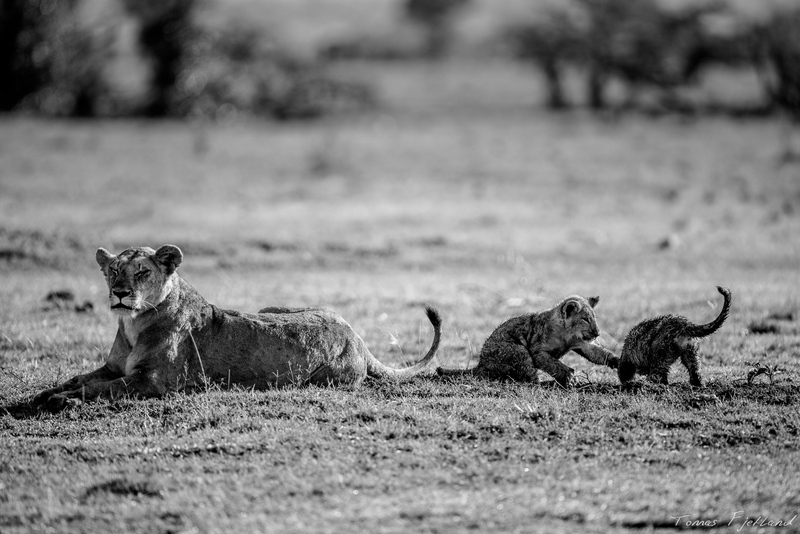 Mother keeps watch as the two young cubs explore an empty warthog burrow. Mom is getting some rest while the kids continue to play “lion and warthog”. As before we’ve brought a packed breakfast with us so we don’t need to return to the camp for breakfast. Quite frankly these breakfasts are so awesome, there’s no reason to eat in camp. You get a full breakfast with eggs, sausage and bacon, pancakes, fruit, coffee or tea as well as juice, and enjoy it to a spectacular view. Why would you sit in a tent? 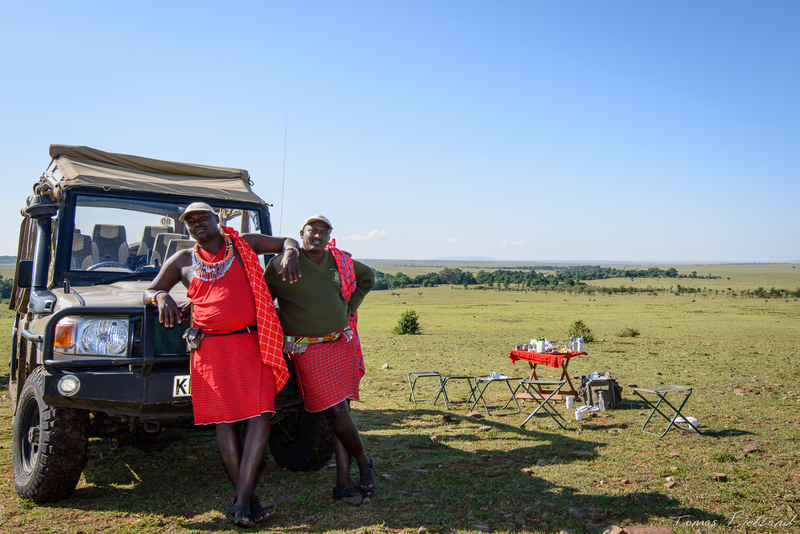 After breakfast I took this photo of Big John and Jared who have been guiding me on all my 3 visits to Masai Mara so far. They are fantastic people and incredible guides. 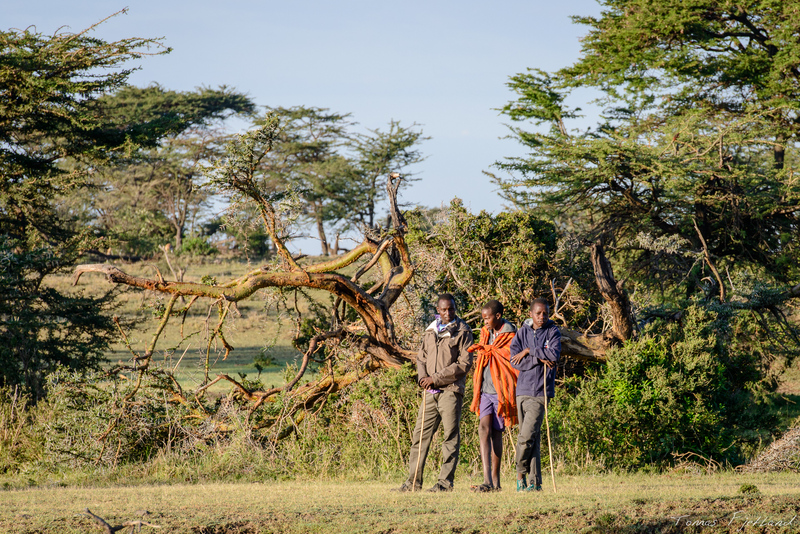 The two fantastic guides that have showed me around the Mara area for my previous 3 trips, Big John and Jared. Another vehicle from Porini Lion coming from the crossing over Olare Orok. Tents of Porini Lion can barely be spotted among the trees to the far right. We set out again in the afternoon for the evening drive. We track some giraffes and buffalos but the light isn’t quite there yet, and there’s not much action. Impalas running next to the car, showing off their agility. 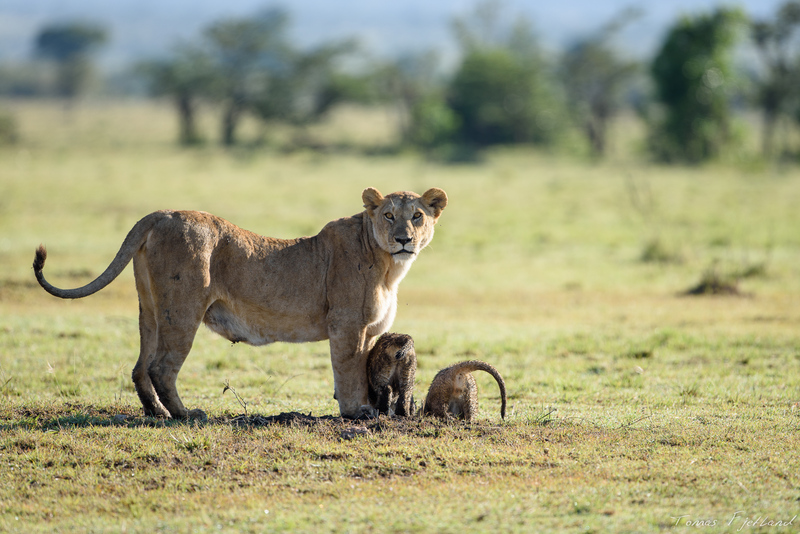 As the light fades we come across another lioness with very young cubs. The cubs are superenergetic and are constantly playing. It’s a bundle of laughs. 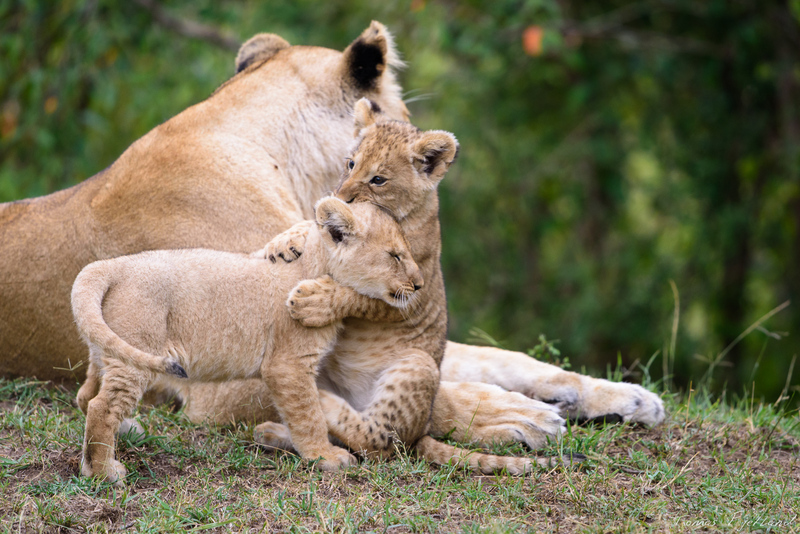 A cub takes a break from the sibling playfighting by relaxing next to mom. 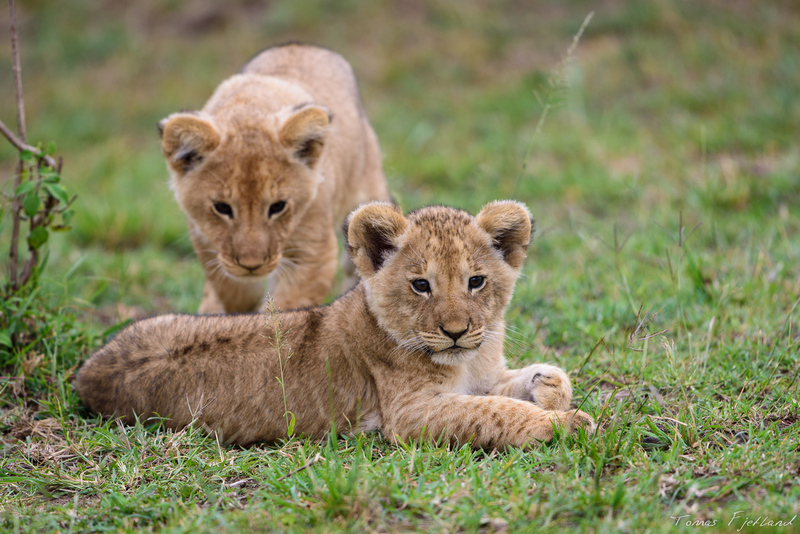 A cub practices its sneaking skills on a sibling. Cubs are training their hunting skills on each other while the mother keeps watch. 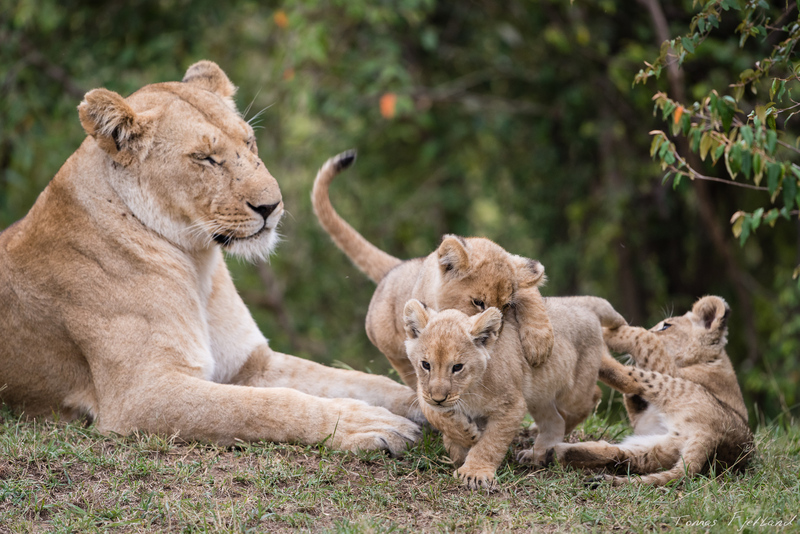 A short break in the play between cubs. 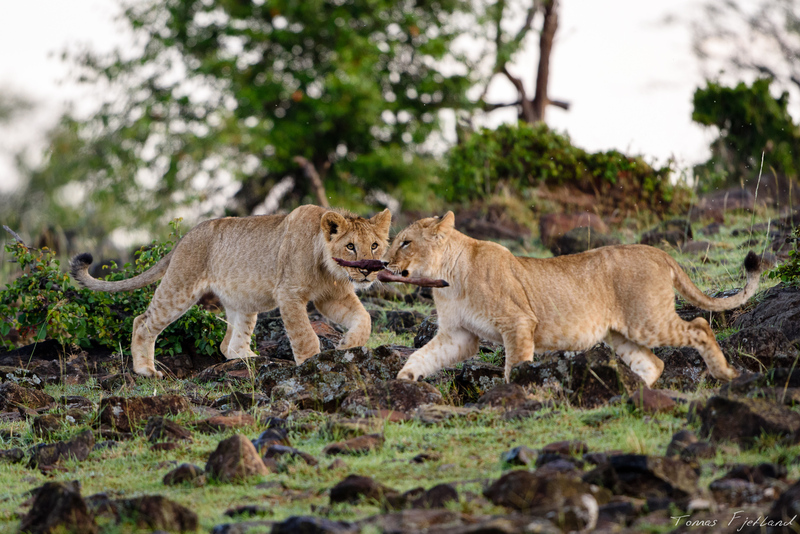 The breaks don’t last long for the hyperactive lion cubs. Soon they’re back at trying to pretend kill eachother. 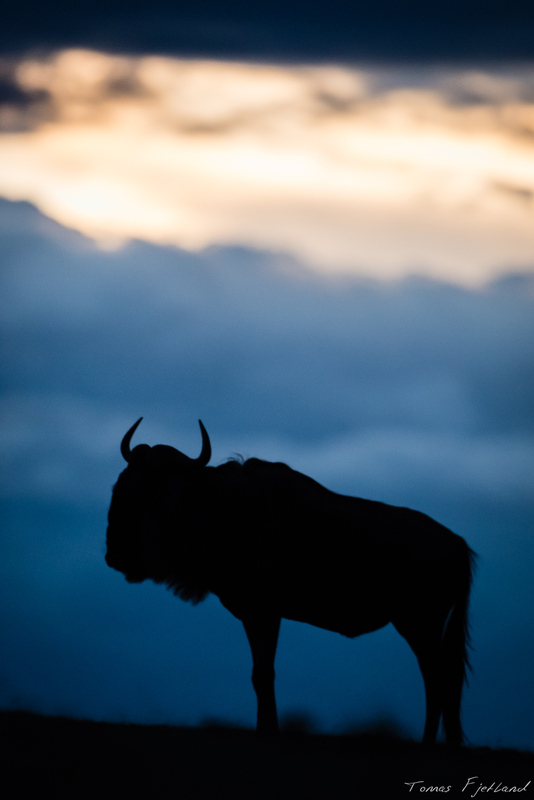 A wildebeest against a cloudy sunset. We return back to the camp earlier than previous evenings, since the light got swallowed by the clouds. 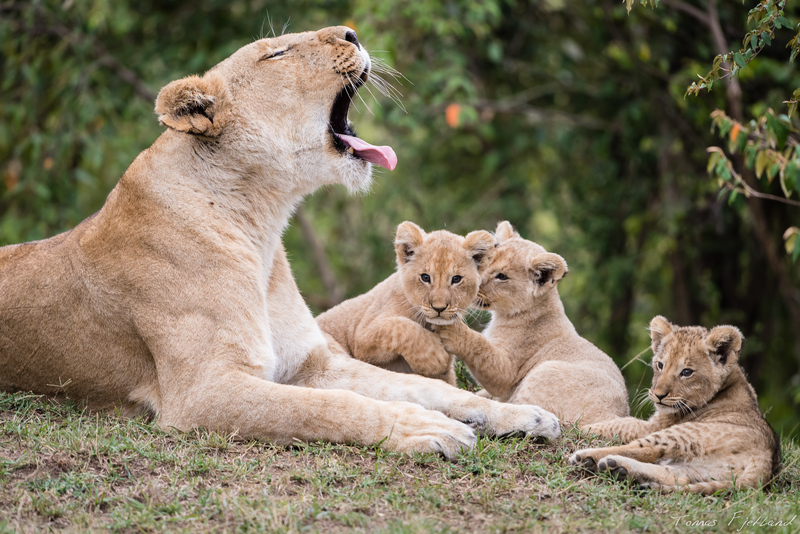 It’s been a roaring day with lots of lion cubs. You can’t honestly have too much kittens, can you?